Set up the dishes in numerical order and offer up the items that you have found for counting. Show the children how to count the correct number of items in to the corresponding dish. Once the child feels confident with this you can extend the learning by turning it in to an addition activity. By selecting 2 dishes you can add together the combined total of those quantities. For example 1+3= ? Empty out both dishes and count all of the items. It creates a very visual way of learning addition. Not only is it hands on but it is tactile too. 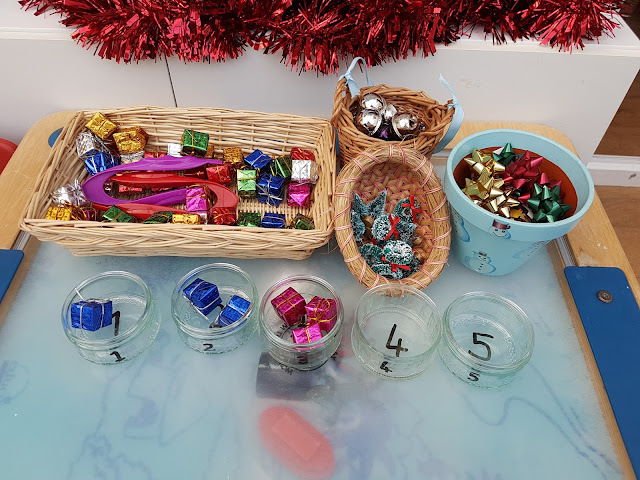 The children can hold and move the items and see that the quantity is still the same no matter how they arrange them on the table. You could add a number line to this as well to support the addition. Remember that this can be adapted for different themes, interests and celebrations! To see this in action then please pop over to my YouTube channel were I show examples of this activity in use. SORTING CHRISTMAS SOCKS! simple grouping activity! EARLY YEARS HALLOWEEN MEASURING ACTIVITY.